Growing up, I loved to draw, and spent countless hours filling up sketch pads with cartoons of goofy looking people and animals. When it came time for college, I did what every aspiring artist does whose parents were footing the bill, I majored in economics. After graduation, I felt my creative side pulling at me again. I tried to satisfy it by finding a job in advertising, but all of the agencies I interviewed with failed to see the connection between a degree in economics and the type of creative job I wanted. With plenty of extra time on my hands, I started drawing all the time. My childhood cartooning bug had come back, and it bit me hard! I managed to sell a few cartoons to some magazines and newspapers. But the truth is, it was a hard way to make a living. The question was, how to draw cartoons and earn an income at the same time? And then it struck me, if I want to see my cartoons in print, why not just print them myself? Why not start a greeting card company? How hard could that be? So I printed up 10 designs, and headed off to New York City and the National Stationery Show to find fortune and fame. I spent three days wandering around the show wearing a blue T-shirt with white iron on letters that read, “SNAFU Designs Is Looking For Sales Reps”. I got a lot of funny looks, but no reps.
Needless to say, the first couple of years were a struggle, but they were also exciting. It was a thrill to actually have stores ordering the cards I drew… and reordering them! To finance my business during those lean years, I worked a variety of forgettable jobs and ate a lot of macaroni and cheese. 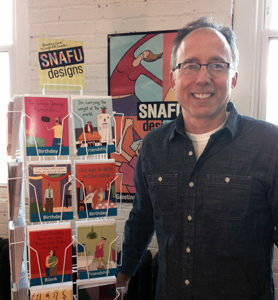 My line gradually started attracting more sales reps, and SNAFU greeting cards began to pop up in stores across the country. I’m happy to report, that SNAFU Designs is no longer headquartered out of my parents’ basement. (They kicked me out years ago!). We now occupy a 1,500 square foot warehouse, and continue to grow. Today the cards sell in most of the 50 U.S. states and also in Canada. Looking back, I remember sitting in that basement and wondering what I would be doing in ten years. I am happy to say, ten years have come and passed, and although I have a little less hair to show for it, I am still doing what I’ve always loved to do…drawing cartoons!